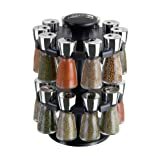 YouCopia invented the SpiceStack in 2006 for a better way to organize grocery store spices. 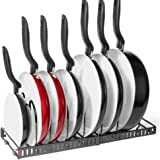 Now it’s a top-rated product for home cooks everywhere! 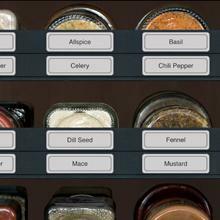 SpiceStack organizes spice bottles in your kitchen cabinet. 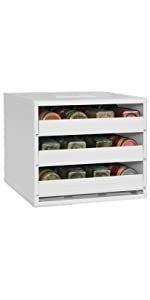 Save valuable counter and drawer space by storing bottles horizontally in the dark cabinet to protect flavors. 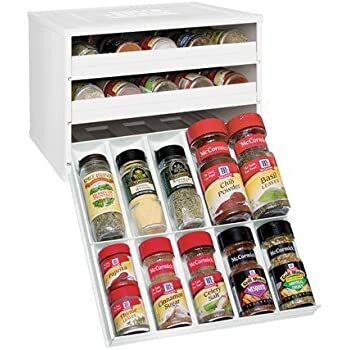 Save time with drawers that pull out and lower to resting position at eye-level so you can easily locate and reach your spices while cooking. 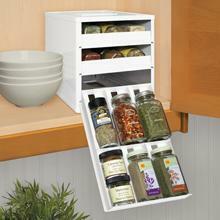 It’s a simple solution to help you clear clutter and organize your entire spice collection! 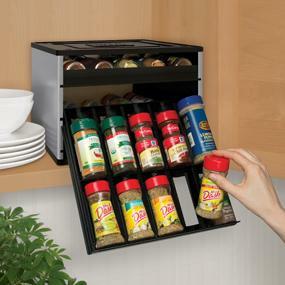 Simply fill SpiceStack with spices and place in a standard kitchen cabinet. 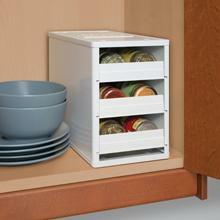 Non-slip feet and the weight of unopened drawers keep the unit in place during use. No assembly or installation is required. 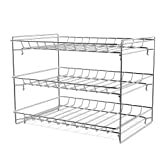 Multiple units can be stacked on top of each other. 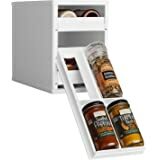 SpiceStack’s clever “flip-down” drawers extend and lower to resting position at eye-level. 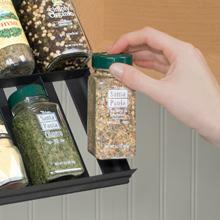 Spice labels face out so it’s easy to locate and reach the spice you need, every time. 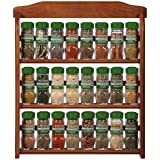 Spices can be arranged alphabetically or by frequency of use – it’s your choice! 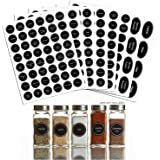 All SpiceStacks include removable stickers so you can label the outside of the drawers for even faster selection of spices while cooking. 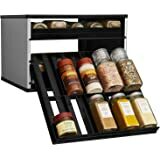 Each spice has its own compartment so you’ll know exactly where your spices belong (and can avoid buying duplicates). 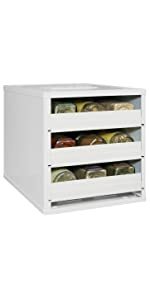 Available from these sellers Amazon.com e-topus eMarket Retail All Products Co. All Products Co.
YouCopia creates innovative home organization products to help you simplify and enjoy life. 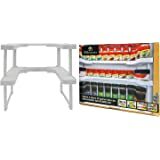 See all the SpiceStack details below including a comparison for each model. 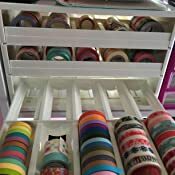 5.0 out of 5 starsPerfect for Washi tape!! 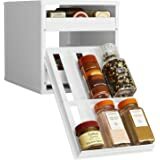 There is little room in my condo and I desperately needed storage space for my spices. This holds a lot; you can even double up on the small spice jars. I placed it on my wide granite windowsill because I didn't want it to sit on my counter top. It is rather large; don't think it would fit in a cabinet; maybe a pantry. 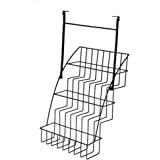 The plastic is adequate but you can't slam the rack around or I'm sure it will crack. 5.0 out of 5 starsWorth it to buy on here, dont spend the 30+ at a "organization store"
I bought this thing after research online and in stores for months. 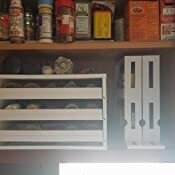 I had the stepped spice rack and several other varients for years and didnt like how mych space was wasted in the back rows. 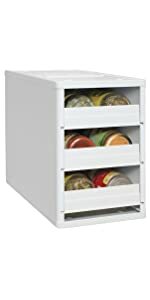 It does feel a little shaky, its plastic, and some of the square bottles are a little too big but it still works, it just takes some consideration when closing and opening. 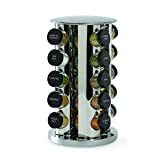 The wife cant complain about all my spices now that they all are organized and take up a little less space now! 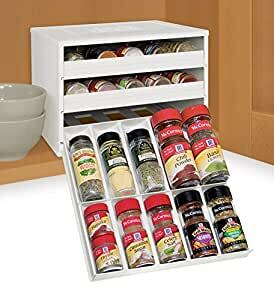 My over sized spices dont fit obviously however I have a cabinet designated for spices and such. Can't hardly imagine how anyone could make more efficient use of precious cupboard space. 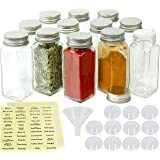 This really, really makes it easy, in 1-2 seconds, to have 10 (to 20 if they are the small containers) of spices laid out beautifully in front of your eyes to pick from. We are now on the lookout for the best bottles to move our spices to. 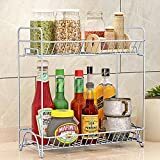 On Christmas morning, we very quickly moved most all of our spices to this "30 bottle" rack, but for some reason we have a lot of glass bottles, and the weight, although seemingly supported well, does cause the bottom to bow a bit under the weight. Not sure what the long term effect will be, so would rather try to take some of the weight off if I could so as to minimize the strain. Note, on the included photos, that some of my bottles are upside down. I only did that because some of my silly bottles have the labels on the top of the bottle. Makes it easier to spot them when I pull them out. 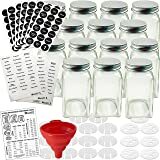 It's a temporary solution, I'd like to think until we get them all labeled on the front, and replaced with lighter bottles. 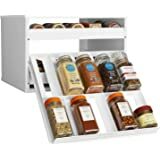 Overall, we are THRILLED with this spice rack, after trying several different approaches to keep the cupboard organized, and be able to find the spices when we need them. This solution is far and away, the best. 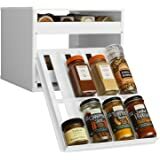 I don't expect we will be turning away from the YouCopia spice rack. 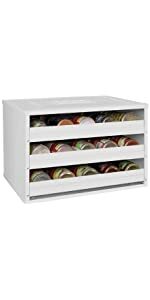 5.0 out of 5 starsThis got my cabinets so much more organized! I love this thing! 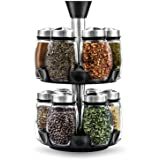 I used ot have spice bottles knocking against each other and falling down when I reached for one all the time. I've tried things like little step-shelves, and a rotating disk to store my spices, but it never organized them like I wanted, and I still had the issue of knocking them over a lot. So I'm a lot more organized now, and I love being able to pull out a drawer and see all the labels of my spices. - I have the largest one, and...well, it's pretty big, of course. It actually only fits in one of my cabinets, so make sure you measure. 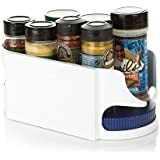 - All of my normal full-size spice bottles fit in the slots. But you know how you can get half-size bottles? And depending on the brand, they're either round or square. Well, the round ones can be stacked two in a slot, but the square ones are just a little taller, so they can't be stacked. That's a little annoying. After receiving this item I received an email from the seller asking for my feedback. 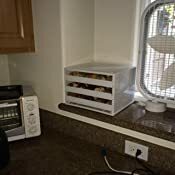 I told seller what I perceived to be a flaw at the bottom of the unit. Although it did not affect the functionality of the item, the seller wanted to "make it right". They offered to replace the item but since I had already set it up, labels on, etc. I didn't want to go through that hassle. Let me just say they "made it right" in other ways. This seller was MORE than a pleasure to deal with and I applaud them for their customer service. 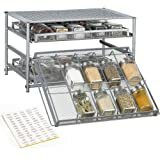 I do really like this unit as it makes access to spices much more of a breeze i.e. no falling bottles or jumbled mess. 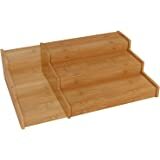 One caveat, make sure you measure the depth of your cabinets. I didn't think it was going to fit at first, but it did. Again BRAVO to YouCopia. My wife takes 8 medications a day, and need to have more on hand. 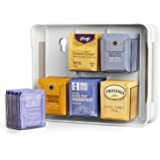 Keeping them organized when we travel is incredibly easy with this device. 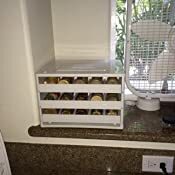 There are three sliding drawers, each with two rows that accommodate 5 bottles; total capacity: 30. We file the meds alphabetically. 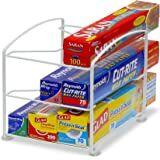 One advantage of using this for medications is to keep the rack in its display box. 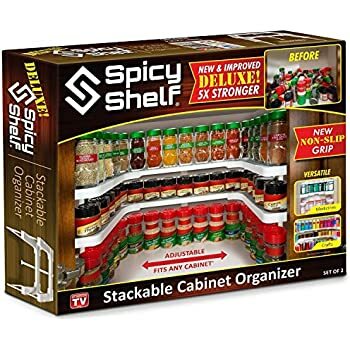 It's easy to keep track of meds this way, they are always in the same place, and were someone to break into our car, the last thing they're going to nick is a spice rack. 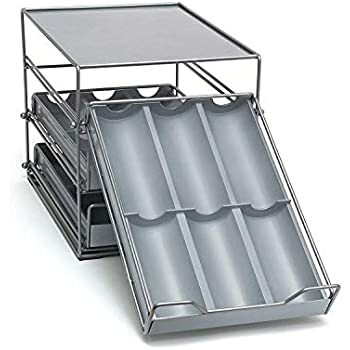 One caution: Always carry the box in horizontal orientation, don't turn it on its end or the contents Will get rearranged, possibly making it difficult to slide open the drawers and disrupting your "filing system". Thank you, YouCopia: we cope(ia) better thanks to your innovative design. We've had this for two years now and it's part of our daily routine that makes managing meds immensely easier.